Chassis no. 829AR0001683 - Engine no. The Lancia Strato’s HF (Tipo 829), widely and more simply known as Lancia Stratos, is a rally car and sports car. The HF stands for High Fidelity. In the definitive version for rallying, the Lancia Strato's disclosed a remote origin from the sensational show-car exhibited by Bertone at the Turin Motor Show 1970. Bertone knew that Lancia was looking for a replacement for the ageing Fulvia for use in rally sports and so he created an eye-catcher to show to Lancia. After that a cooperation between Lancia and Bertone was decided to develop a new rally car designed by Marcello Gandini. Lancia presented the Strato’s HF prototype at the 1971 Turin Motor Show. With its space-inspired lines, Nuccio Bertone was initially going to call the car the Stratolimite before the final name was chosen. The new project was developed on a wheelbase of 2160 mm and equipped with a Ferrari-conceived 6V 2.4-litre engine, fitted transversally in front of the rear axle. The use of the Dino V6 was planned right from the beginning of the project, but Enzo Ferrari was reluctant to sign off the use of this engine in a car he saw as a competitor to his own Dino V6. After the production of the Dino car had ended the "Commendatore" agreed on delivering the engines for the Strato’s. The Strato’s weighed between 900 to 950 kilograms, depending on configuration. Power output was around 275 hp (205 kW) for the original 12 valve version and 320 hp (240 kW) for the 24 valve version. The bodywork, very low and compact, featured a small two-seater cockpit, with elegant, constant radius wraparound windshield which extended from one side to the other. The car's design was highly innovative. Manufacturer of the car was Bertone in Turin, with final assembly by Lancia at the Chivasso plant. If the fathers of the Strato’s were Nuccio Bertone, Marcello Gandini and Pierugo Gobbato, the men behind the entire rallying project were Lancia team manager Cesare Fiorio, British racer/engineer Mike Parkes, official test driver Claudio Maglioli and factory rally driver Sandro Munari. Lancia did extensive testing with the Stratos and raced the car in several racing events where Group 5 prototypes were allowed during the 1972 and 1973 seasons. Production of the 500 cars required for homologation in Group 4 commenced in 1973 and the Strato’s was homologated for the 1974 World Rally Championship season. Lancia with the Strato’s won the International Manufactures’ Championship in 1974, 1975 and 1976 and the World Rally Chanpionship in 1977. The racing version was produced in 26 units out of a total of about 500 Strato's (1972-1975). The "Works" Strato’s paint schemes were: from 1973 to 1975 Marlboro (red-white); from 1975 to 1977 Alitalia (white with Italian flag colours: green-white-red) and in 1978 Pirelli (black-red). The Lancia Strato's “Alitalia”, with registration number TO N41648, chassis 829AR0001683 won the 1977 Rally Monte-Carlo with official team Munari-Maiga (entry number 1). Before that it came second at the 1976 Rally Sanremo and won the Tour of Corse the same year with the same team. Then followed many races in Italy and abroad with Alitalia livery as well as Pirelli. 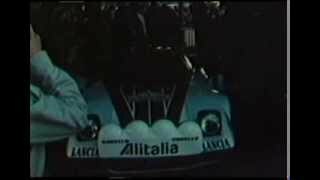 It was also raced by many drivers as Mauro Pregliasco, Attilio Bettega, Fulvio Bacchelli, Antonio Carello and Markku Alen. It is a 24 valve version with the power output of 320 hp (240 kW). After the property Lancia, from June 1984 to February 1993, it was owned by Claudio Maglioli.